The Amish Poly Cape Henry Lighthouse is a lovely replica of the original that stands in Virginia. Made of poly lumber, this outdoor decoration is one you won't have to worry about breaking down. Poly is made of recycled plastic and proves to be ultra strong against outdoor elements. 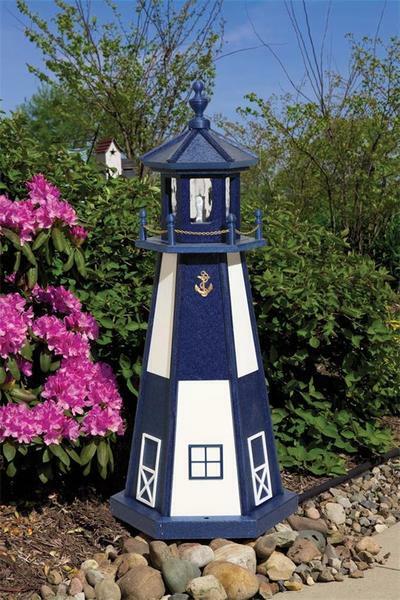 Choice of 2', 3' or 4' lighthouse with a wide variety of colors available. You can go with a standard electric light or choose to have a solar light put in (for 3' and above only). Add that extra lighting outside with an attractive new lighthouse custom made just for your home. Note: The first color listed is the top color/main color.